Set in landscaped gardens with 3 large communal pools (one heated in winter), 2 bedrooms and 2 bathrooms, sat tv, a/c, 24 hr security and lock-up garage, this new apartment provides luxury accommodation in an ideal location. As you will see this apartment has been furnished to a very high specification to ensure your stay is as comfortable and relaxing as possible. The development is also ideally located for quick and easy access to the area’s two international airports of San Javier in Murcia and El Altet in Alicante. If you fly to Murcia airport it's just 20 minutes door to door. The other airport you could of course use is that of Alicante, which is about 40 minutes away. Both airports are served by most major and budget airlines from all over Europe. The Quality and comfort of this apartment will be evident in the immediate surroundings. So why not enjoy a cup of coffee on the veranda overlooking the resort gardens, or stroll in pleasant surroundings just outside. We look forward to welcome you soon to Señorio de Punta Prima! This gorgeous 2- bedroom first floor apartment is brand new and provides luxury accommodation in an ideal location. The furniture has been hand picked by the owners to a very high standard providing elegant holiday accommodation. The apartment is approximately 85 m2 in size plus a spacious balcony. The property, built to a very high specification has marble floors throughout and ducted reverse-cycle air-conditioning resulting in a standard which is far higher than anything you could find in this region. It has under-floor heating in the bathrooms for winter use and the balcony can be accessed from the lounge and both bedrooms via full width patio doors with wooden shutters. The apartment boasts a large living area with a very comfortable sofa and armchairs, together with a TV table, coffee table and glass cabinet. Satellite TV has been installed and provides more than 70 television channels, The majority of these are in English. Also available is a fully functional Zanussi kitchen with a fridge/freezer, dishwasher, oven, hob and microwave oven. A separate laundry room contains the washing machine/tumble dryer and hot water heater. A dining table with leather chairs is located just outside the kitchen and seats 6 people very comfortably. WIFI has also been installed recently. The apartment has two bedrooms, one with a double bed and another with two singles. Large fitted wardrobes are available in each bedroom, together with bedside tables, mirrors and chest of drawers. Another large fitted wardrobe can be found in the hallway ensuring that there is plenty of storage space throughout the apartment. There are also two large bathrooms with fitted mirrors, and one of these is en-suite to the master bedroom and has his and hers wash-hand basins. Access to the apartment can be made using one of two lifts or by means of a staircase. The lifts also provide direct access to the underground personal parking space with remote garage door. The balcony itself overlooks one of the three large communal pools and landscaped gardens. A table and four chairs plus parasol have been provide for outdoor dining. The Costa Blanca – the White Coast is celebrated for its white beaches stretching mile after mile, pleasant climate and clear blue skies. This idyllic coastal area has more to offer than sunshine and seaside life. Small detours to the interiors give you a taste of fascinating Spanish culture and history. The largest city in the Costa Blanca is Alicante, known for its many restaurants and bustling nightlife. The Costa Blanca is an exciting blend of the old and the new, tradition and progress. – as you’ll soon discover for yourself!! Elche with its famous palm groves. Southern Costa Blanca also offers a great choice of golf courses including the prestigious trio at Villamartin, Las Ramblas and Campoamar situated to the west of Cabo Roig. Las Ramblas is a very picturesque and desirable area. Campoamor has a superb newly built hotel, clubhouse and sports complex, the course plays long with wide fairways. Villamartin a championship course has a bustling square at its centre offering international restaurants and bars. They are all within a 10 minute drive away with La Finca and the famous La Manga complex, only a short drive away. Orihuela Costa also has extensive facilities for nautical sports of all kinds at its Cabo Roig and Campoamor Marinas. This includes sailing, water skiing, wind surfing and scuba diving which are available throughout the coastal area. Bowls, horse riding, aqua park activities and tennis clubs are just a few of the varied interests available in this area. All this, together with the World Health Organisation's Award for clean air standards and the superb medical facilities available in the region, have made this the popular choice for so many people to live. Punta Prima is only 10 minutes south of Torrevieja which is built around a traditional fishing village. It is a town with typical Spanish character with its fountains, squares, churches and numerous restaurants. The town also boasts the largest yacht harbor on the coast. This town caters for all the family and you can take part in many activities such as walking, snorkelling, swimming and horse riding. Torrevieja is also home to two large natural salt lakes, which have contributed to the area's reputation as one of the healthiest places in the world to live. It is also worth knowing about the new cycle path, which encircles the Torrevieja salt lake. It is to these salt lakes that sailing ships from Cuba anchored in the docks to load salt and consequently their influence can still be felt around Torrevieja. The mud baths around the salt lakes are a popular spot for those who are looking to alleviate their aches and pains or just for having fun in the mud! The famous Friday market is certainly not to be missed, it sells everything from fresh fruit to housing accessories and gifts and of course there is plenty of choice in the many boutiques of the town. A living, breathing, commercial Spanish town! The lovely Maritime Paseo (Promenade) alongside the Mediterranean with bars and restaurants completes the picture. Punta Prima has two small beaches which are within easy walking distance of the apartment. The main beach is only 5 minutes walk down past the Punta Prima Restaurant. There is a more secluded beach surrounded by palm trees to the left of the resort toward Torrevieja. Go down to the sea front and follow the path along the coast from the Nautilus Restaurant to find this. The beaches at nearby La Zenia and Campoamor are long white sandy beaches with blue flag status. There is also a beach next to the marina in Torrevieja which is very well sheltered and good for small children. You might also take a trip to the Mar Menor which has lots beaches and is very safe because it is a saltwater lake. Guardamar, north of Torrevieja, has a lovely pine forest w hich leads to a long sandy beach with sand dunes. It is about 20 minutes drive away and well worth a visit. There are beach bars on beaches during the summer but Guardamar pine forest is a lovely place for a picnic. -The apartment ideally sleeps 4, but a king size air mattress has also been provided for your use should you need to sleep an extra one or two persons. -A comfortable baby travel cot is available in the apartment. -A Highchair is available for your use free of charge. -No pets are allowed and smoking is only permitted on the balcony. 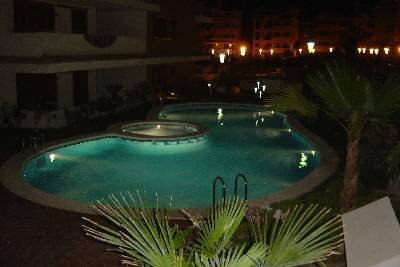 -It is necessary to respect the community and swimming pool rules which will be provided once contact is established. -Linen and bathroom towels are provided free of charge (except beach/pool towels). -There is no charge for end of let cleaning. -You are kindly requested to take care of the apartment as it is also our home. -The whole complex is wheelchair friendly. -Welcome packs and reliable airport transfers can be arranged upon request. -Car hire is available directly at the airport. We could provide recommendations.